This delicious and easy to grow non-heading Chinese Cabbage is becoming very popular. 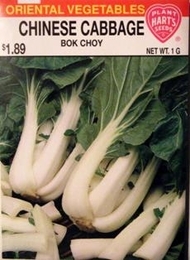 Bok Choy is tender, sweet, crisp and delicious. The leaves are excellent in salads like celery, or stalks and leaves can be stir-fried alone or with other vegetables or meat. Cut outside leaves when young or entire plant when 10-14 inches tall. This helps stop the plant from becoming a long stalk. Planting time - Early to Late Spring. For Fall crop plant in Late Summer. Bulk Chinese Cabbage seed available. 5lbs of Chinese Cabbage seed needed per acre, 8oz needed per acre if using transplants. On average, 1oz of seed can produce 2500 cabbage plants.